Wigan Athletic paid the penalty for a shocking spot-kick miss from Josh Windass as their away-day misery continued in South London. Latics had taken the lead - somewhat against the run of play - seconds before the interval when a Lee Evans free-kick was bundled home by Millwall’s Jed Wallace. 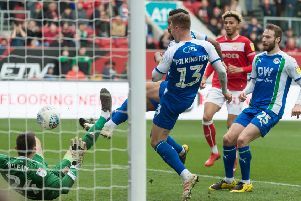 And they were odds-on to double their advantage just before the hour mark when they were awarded a penalty following a foul on James Vaughan. However, Windass - who’d played in Vaughan - blazed his spot-kick miles over the crossbar to let the home side off the hook. And the Lions took full advantage by levelling the scores barely a minute later. Again there was spot-kick drama, with Shaun Williams scoring from 12 yards after Reece James had fouled Aiden O’Brien. And there was to be a late sting in the tale, when Latics couldn’t clear their lines, resulting in Steve Morison slotting home from close to range to claim all three points. The result extends Wigan’s woeful form on the road to six defeats from seven matches - in stark contrast to the DW, where they have the best home record in the division. But boss Paul Cook will be ruing the sequence of events just after the restart that gifted their opponents a way back into the game. The opening 45 minutes was little to write home about, with Millwall on top but unable to force Christian Walton into much work. Lee Evans, Windass and James tried their luck for Latics without success, but Millwall were certainly enjoying the lion’s share of the ball in good areas. However, they were rocked on their heels just before the break as the visitors took the lead. Latics had given a warning of their danger when Callum Connolly headed just wide from an Evans corner. But it wasn’t heeded and, from Evans’ next set-piece delivery, Kal Naismith - one of three changes tot the starting line-up - caused confusion at the near post, resulting in Wallace steering the ball past his own goalkeeper. If the goal came against the run of play, the home fans would have been even more furious at the start of the second period as Latics blew two gilt-edged openings to gain a stranglehold on proceedings. First, Evans and Windass got Vaughan clean through, only for the striker’s horrible touch to allow the Millwall goalkeeper to come off his line and smother. Then, moments later, Windass again linked up with Vaughan, who was felled in the box for a penalty. Windass - in the absence of Will Grigg and Nick Powell - placed the ball on the spot, but fired well over the top to the relief of all the home fans inside the stadium. And within 60 seconds, those same fans were on their feet in joy after the referee awarded their side a penalty. James was adjudged to have felled O’Brien, and Williams made no mistake to tie things up. Latics threw on fresh legs in the form of Powell and Nathan Byrne for Vaughan and James, but were unable to hang on for even a point. As the game entered the last 10 minutes, Naismith was beaten far too easily down the Latics left, the cross wasn’t cleared, and Morison couldn’t miss from bang in front. Not even the late introduction of Callum McManaman, for Windass, could tip the balance back Wigan’s way, with Latics unable to force a late leveller, Powell heading wide from a last-gap free-kick.